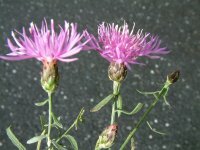 Centaurea maculosa (spotted knapweed) is a biennial to short-lived perennial (family Asteraceae). It can be found in disturbed open sites, grasslands, overgrazed rangelands, roadsides and logged areas. It crowds out native species and forage for livestock, and can invade undisturbed native bunchgrass stands. An individual plant may produce as many as 40,000 seeds.